Friends of ours, The Snowdens, gave this to us - I'm thinking it was 2 or 3 years ago. It is a favorite because it reminds me of our two cats, Aggie and Dutchess, who were with us for 18 and 19 years. This ornament, and another one that says "PURRR" are memorials to these special cats. A friend of mine, Debra, gave this to me the Christmas before we both went our separate ways to college. It is engraved with the year I graduated from High School. 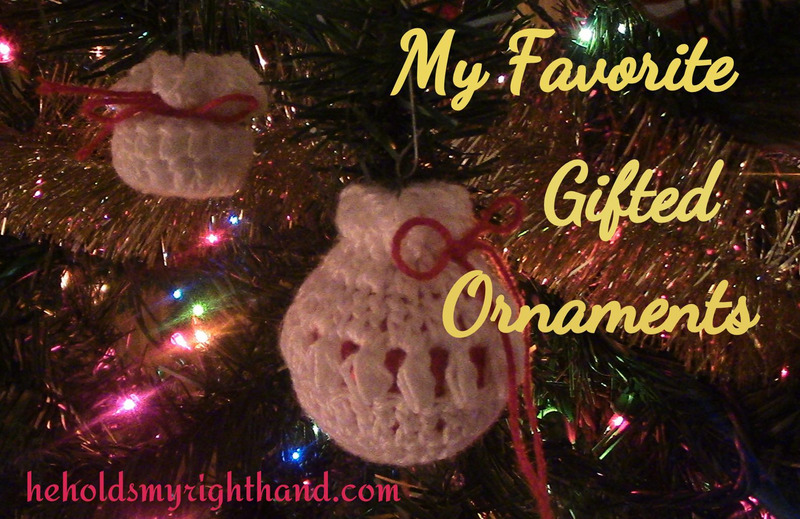 My sister, Judith, crocheted these ornaments for us when David and I were newly married. The bigger one is crocheted around a small red ornament; and for the smaller one, she used a plastic cap from a water bottle. I love them because they were crafted for us with Judy's time, and with her love. I put them on our tree every year. I don't remember who gave this one to us, but it says, "Our First Christmas Together - 1992" It was a wedding gift. I hope you are enjoying your holiday season, remembering the good times you have had in the past, and making new memories this year with family and friends. Above all, be at peace, because the Prince of Peace was born to bring you hope.